Konza Prairie Biological Station (KPBS) is located on a 3,487 hectare native tallgrass prairie preserve jointly owned by The Nature Conservancy and Kansas State University. The KPBS is located in the Flint Hills of northeastern Kansas (39°05’ N, 96°35’ W), a grassland region of steep-slopes overlain by shallow limestone soils unsuitable for cultivation. The Flint Hills region encompasses over 1.6 million hectares extending throughout much of eastern Kansas from near the Kansas-Nebraska border south into northeastern Oklahoma, and contains the largest remaining area of unplowed tallgrass prairie in North America. Hence, the vast majority of Konza Prairie, and the surrounding landscape, has not been plowed and retains its native characteristics. KPBS is operated as a field research station by the KSU Division of Biology. The station is dedicated to a three-fold mission of long-term ecological research, education, and prairie conservation. 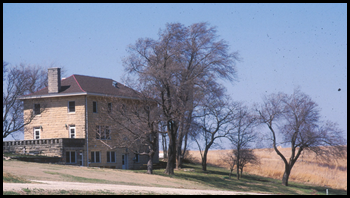 It is a unique outdoor laboratory that provides opportunities for the study of tallgrass prairie ecosystems and for basic biological research on a wide range of taxa and processes. The station is open to scientists and students from throughout the world.